What Would Peter Burnett Think? I’ve been wondering how Peter Burnett, dead these 123 years, would have reacted to my new book, “The Troubled Life of Peter Burnett: Oregon Pioneer and First Governor of California.” Would he hail it as a validation of a life of struggle, or denounce it as grossly unfair? I asked myself this question after receiving a note from one of his descendants. She said after reading the book that she wished Burnett had been more successful in the many roles he played during his life. The Tennessee-born Burnett had accomplishments, but they have been largely overlooked because of his more widely publicized failures, most notably as California’s first governor in 1849-1851. He resigned before finishing his term in the face of widespread public ridicule for his anti-black policies and some tone-deaf decisions, such as changing California’s Thanksgiving observance from a Thursday to a Saturday, presumably for his own convenience. He was ridiculed again for a pro-slavery ruling while serving on the California Supreme Court in 1858. The book also tracks his lack of success as a merchant in Tennessee and Missouri, and his resignation as the first captain of the 1843 wagon train to Oregon after just seven days on the trail. At first glance, there wasn’t much about which he could legitimately boast. The reason I wrote the book was because I wanted to know more about this restless man, who seemed to be everywhere, running the fledging Oregon government, the new California government, serving on courts and legislative bodies in both places, gold-mining, leading wagon trains, building cities, and more, and not staying in any one position too long. Indeed, in deciding on a title, I was tempted to use “The Leader Who Could Not Lead,’’an apt description of Burnett’s successes and failures. A self-taught attorney, he was handsome, well-spoken and intelligent—people comfortably turned to him for leadership. But responsibilities seemed to overwhelm him, and he too often failed to deliver, disappointing many of those who supported him. In later years, after finally retiring from public life, he found success as a banker and became deeply involved in the Catholic church. We can’t know, of course, what Burnett would have thought about the book—he died in 1895. But my guess is he would have privately appreciated it, while publicly denouncing it. After all, he’d been virtually forgotten by history. His portrait does hang with those of other governors in the California State Capitol in Sacramento. His name also appears on a frieze around the ceiling of the Oregon House of Representatives in Salem. But very little has been written about him in depth, either in Oregon or California. And what little is written, focuses on his racism, underscored by his dogged attempts to exclude African Americans from Oregon and Washington. My book also focuses to a considerable degree on his racism, including such onerous policies as advocating whipping for blacks who refused to leave Oregon— remembered as “Peter Burnett’s Lash Law.” But there was more to Burnett than his racism, which, for someone raised in a slave-holding family, might be understood—if not forgiven. The Troubled Life gives Burnett credit for his relentless campaigning for the first American governments in both Oregon and California, for helping organize the 1843 wagon train from Missouri to Oregon, and another wagon train from Oregon to California, and for his role in helping establish the city of Sacramento. Earlier in his career, while still in Missouri, he was one of the defense attorneys for Mormon leader Joseph Smith following the 1838 Mormon war. But probably most important to Burnett, rather than any single accolade would be that the book recognizes his place in history. We know Burnett wanted recognition because he frequently boasted of his achievements, perceived or otherwise. Among notable exaggerated claims was that he fathered California statehood. “I believe I have a right to claim the responsibility of making the first public movement toward the formation of a state government,’’ he wrote a colleague, Samuel Thurston, in 1850. 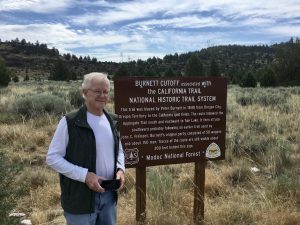 He also claimed he headed off a possible attack on the 1843 wagon train, that he wrote most of Oregon’s first laws, and that he kept John Sutter out of bankruptcy, thereby saving Sutter’s extensive Sacramento Valley land holdings, including Sutter’s Fort. While Burnett tended to exaggerate, most of his claims had at least a kernel of truth. My book, for better or worse, makes him somebody, rather than nobody. And Burnett, raised poor and living in the shadows of wealthy relatives, desperately wanted to be seen as somebody.